Is there a performance benefit to replacing == with ===? Any performance improvement would be welcomed as many comparison operators exist. If no type conversion takes place, would there be a performance gain over ==? The identity (===) operator behaves identically to the equality (==) operator except no type conversion is done, and the types must be the same to be considered equal. The == operator will compare for equality after doing any necessary type conversions. The === operator will not do the conversion, so if two values are not the same type === will simply return false. Both are equally quick. The lack of transitivity is alarming. My advice is to never use the evil twins. Instead, always use === and !==. All of the comparisons just shown produce false with the === operator. A good point was brought up by @Casebash in the comments and in @Phillipe Laybaert's answer concerning reference types. For reference types == and === act consistently with one another (except in a special case). The special case is when you compare a literal with an object that evaluates to the same literal, due to its toString or valueOf method. For example, consider the comparison of a string literal with a string object created by the String constructor. Here the == operator is checking the values of the two objects and returning true, but the === is seeing that they're not the same type and returning false. Which one is correct? That really depends on what you're trying to compare. My advice is to bypass the question entirely and just don't use the String constructor to create string objects. An interesting pictorial representation of the equality comparison between == and ===. Use === unless you fully understand the conversions that take place with ==. In the answers here, I didn't read anything about what equal means. Some will say that === means equal and of the same type, but that's not really true. It actually means that both operands reference the same object, or in case of value types, have the same value. This behavior is not always obvious. There's more to the story than being equal and being of the same type. I thought strings behave like value types? Well, it depends who you ask... In this case a and b are not the same type. a is of type Object, while b is of type string. Just remember that creating a string object using the String constructor creates something of type Object that behaves as a string most of the time. If in doubt, read the specification! Please let me explain how to read the specification to clarify this question. I see that in this very old topic nobody had an answer for the very strange effect. So, if you can read a specification, this will help you in your profession tremendously. It is an acquired skill. So, let's continue. 2. If Type(x) is Undefined, return true. 3. If Type(x) is Null, return true. 4. If Type(x) is not Number, go to step 11. 5. If x is NaN, return false. 6. If y is NaN, return false. 7. If x is the same number value as y, return true. 8. If x is +0 and y is −0, return true. 9. If x is −0 and y is +0, return true. 11. If Type(x) is String, then return true if x and y are exactly the same sequence of characters (same length and same characters in corresponding positions); otherwise, return false. 12. If Type(x) is Boolean, return true if x and y are both true or both false; otherwise, return false. 13. Return true if x and y refer to the same object or if they refer to objects joined to each other (see 13.1.2). Otherwise, return false. Interesting is step 11. 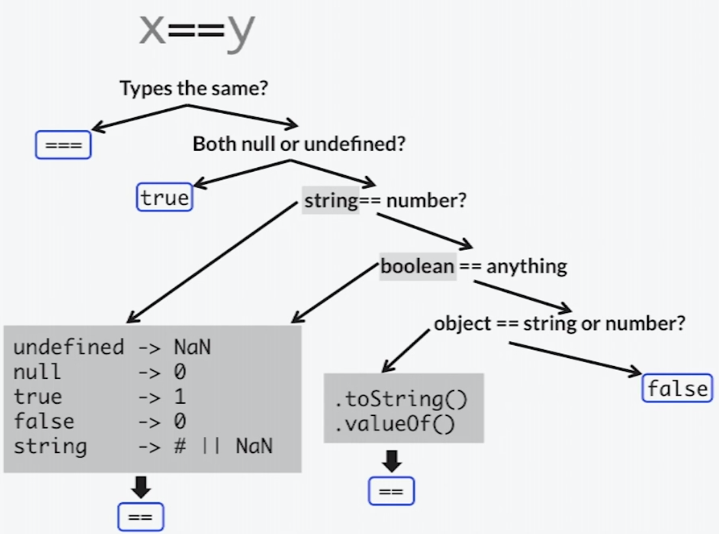 Yes, strings are treated as value types. But this does not explain why new String("a") !== "a". Do we have a browser not conforming to ECMA-262? Let's check the types of the operands. Try it out for yourself by wrapping them in typeof(). I find that new String("a") is an object, and step 1 is used: return false if the types are different. If you wonder why new String("a") does not return a string, how about some exercise reading a specification? Have fun! If Type(constructor) is not Object, throw a TypeError exception. With other words, if String wouldn't be of type Object it couldn't be used with the new operator. new always returns an Object, even for String constructors, too. And alas! The value semantics for strings (see step 11) is lost. And this finally means: new String("a") !== "a". The === operator is called a strict comparison operator, it does differ from the == operator. Lets take 2 vars a and b. For "a == b" to evaluate to true a and b need to be the same value. In the case of "a === b" a and b must be the same value and also the same type for it to evaluate to true. In summary; using the == operator might evaluate to true in situations where you do not want it to so using the === operator would be safer. In the 90% usage scenario it won't matter which one you use, but it is handy to know the difference when you get some unexpected behaviour one day. It checks if same sides are equal in type as well as value. Why == is so unpredictable? What do you get when you compare an empty string "" with the number zero 0? Yep, that's right according to == an empty string and the number zero are the same time. Things get really weird with arrays. When is equal not equal? And this is just the crazy stuff you get with primitives. It's a whole new level of crazy when you use == with objects. Well it's because unlike "triple equals" (===) which just checks if two values are the same. == does a whole bunch of other stuff. 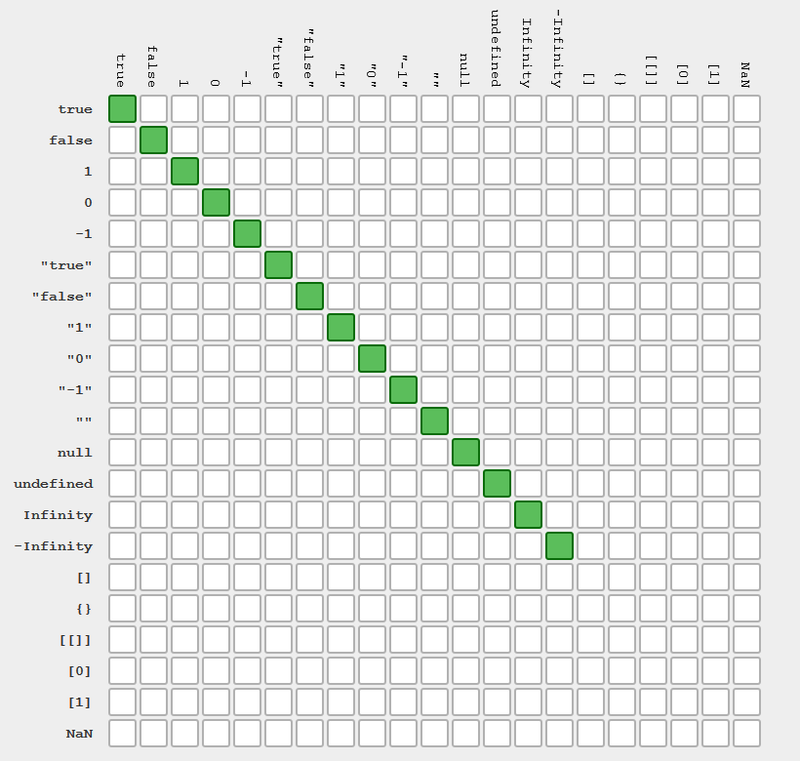 It has special handling for functions, special handling for nulls, undefined, strings, you name it. It means == is complicated. Because it's complicated it's hard to know what's going to happen when you use it. Which means you could end up with bugs. Make your life less complicated. Use === instead of ==. But personally I would do what JSLint suggests. This recommendation is there not because of performance issues, but because type coercion means ('\t\r\n' == 0) is true. The equal comparison operator == is confusing and should be avoided. It's mutually exclusive to its negation: (a == b) and (a != b) always hold opposite Boolean values, with all a and b.
NaN                // NaN is not equal to any thing, even to itself. There is unlikely to be any performance difference between the two operations in your usage. 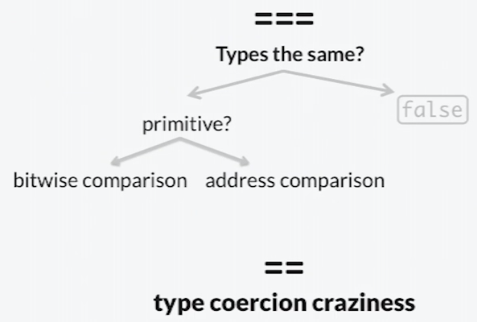 There is no type-conversion to be done because both parameters are already the same type. 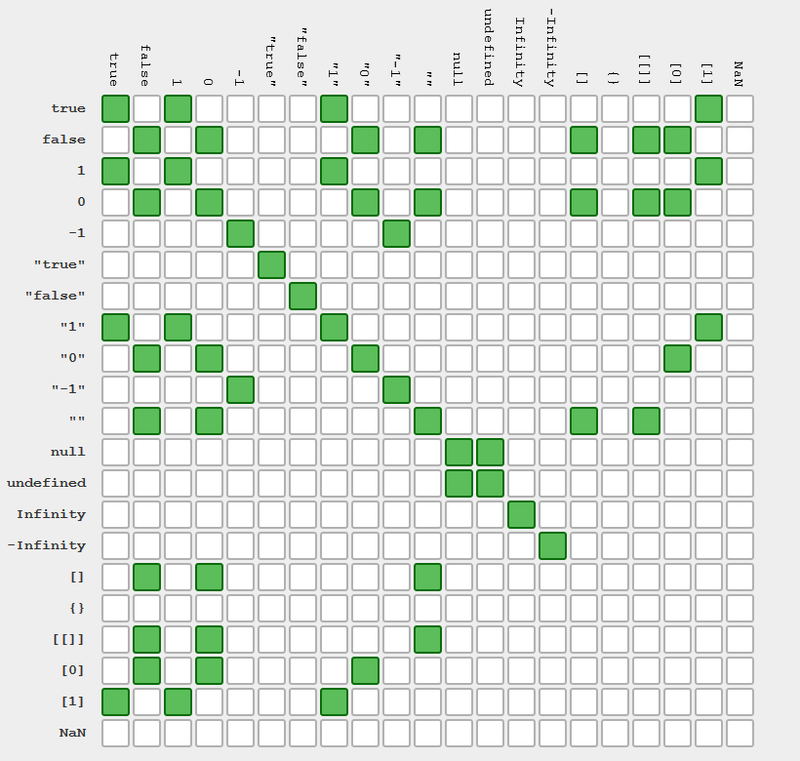 Both operations will have a type comparison followed by a value comparison. You will get 'false' in alert. Now modify the onPageLoad() method to alert(x == 5); you will get true. === operator checks the values as well as the types of the variables for equality. == operator just checks the value of the variables for equality. It's a strict check test. It's a good thing especially if you're checking between 0 and false and null. All returns true and you may not want this. Let's suppose you have a function that can return the 0th index of an array or false on failure. If you check with "==" false, you can get a confusing result. JSLint sometimes gives you unrealistic reasons to modify stuff. === has exactly the same performance as == if the types are already the same. It is faster only when the types are not the same, in which case it does not try to convert types but directly returns a false. So, IMHO, JSLint maybe used to write new code, but useless over-optimizing should be avoided at all costs. Meaning, there is no reason to change == to === in a check like if (a == 'test') when you know it for a fact that a can only be a String. Modifying a lot of code that way wastes developers' and reviewers' time and achieves nothing. As a rule of thumb, I would generally use === instead of == (and !== instead of !=). For example jQuery 1.9.1 uses this pattern 43 times, and the JSHint syntax checker even provides the eqnull relaxing option for this reason. Strict equality checks (===) should be used in favor of ==. The only exception is when checking for undefined and null by way of null. The top 2 answers both mentioned == means equality and === means identity. Unfortunately, this statement is incorrect. If both operands of == are objects, then they are compared to see if they are the same object. If both operands point to the same object, then the equal operator returns true. Otherwise, the two are not equal. In the code above, both == and === get false because a and b are not the same objects. That's to say: if both operands of == are objects, == behaves same as ===, which also means identity. The essential difference of this two operators is about type conversion. == has conversion before it checks equality, but === does not. === Returns true if the operands are strictly equal (see above) with no type conversion. Returns true, when both operands are equal. The operands are converted to the same type before being compared. Returns true if both operands are equal and of the same type. It's generally better and safer if you compare this way, because there's no behind-the-scenes type conversions. Here is a handy comparison table that shows the conversions that happen and the differences between == and ===. "Use three equals unless you fully understand the conversions that take place for two-equals." Why does new String('hello') === new String('hello') evaluate to False?